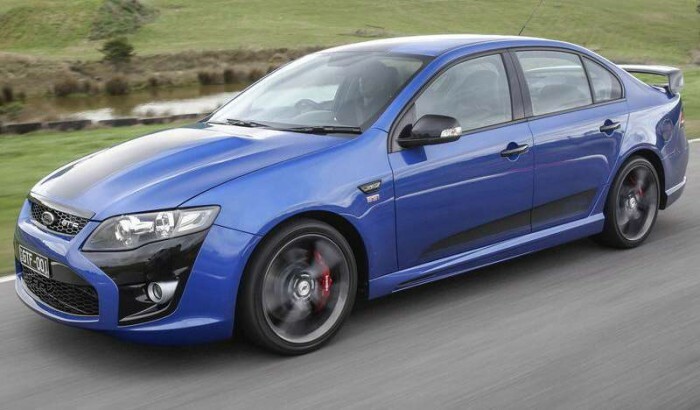 The Ford FPV GT F is a bit of a mouthful, but rest assured unless you live in Australia you won’t be asking for one in a UK Ford Dealership anytime soon. Whilst Americans have had their 50 year love affair with the Ford Mustang, Australians have had an even longer love affair with the Ford Falcon. Since 1960 over 3 million Ford Falcons have been sold in Australia, it is the quintessential Australian muscle car but other than the Falcon’s appearance in the 1979 cult classic movie Mad Max the Ford Falcon has had very little exposure outside of its antipodean shores. So what are we missing? Well the latest incarnation of the Ford Falcon; the FPV GT F is powered by a 5.0 litre V8 producing a huge 470 BHP, thats more than the Ford Mustang GT, and a much larger roomier car too. The Exterior of the GT F is far from subtle, a black stripe travels up from the huge grille over the roof to the huge spoiler on the back, this car is not for the introverted. The interior of the car features supportive leather sports seats featuring GT F embroidery as well as custom GT F dials. Under the bonnet is where the things get serious; a Ford 5.0 lite V8 puts out 470 horsepower and 420 pound feet of torque, the GT F will in theory make it to 60mph in around 4 seconds, slightly quicker than the Ford Mustang GT. We’ll never see a Ford Falcon of this type available officially in the UK but if you ever took it upon yourself to import one privately at least you know the steering wheel is already on the right hand side of the car.